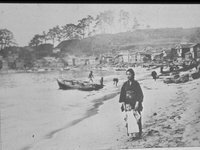 Dr. Kobayashi will talk about the conditions in Japan, and the impact of emigration on Japanese villages, and also about conditions in early Vancouver. A native of British Columbia, Dr. Audrey Kobayashi completed a B.A. (1976) and M.A. (1978) at the University of British Columbia, and a PhD (1983) at UCLA. Dr. Kobayashi taught in Geography and East Asian Studies at McGill University from 1983 to 1994, when she came to Queen’s, initially as Director of the Institute of Women’s Studies (1994 to 1999) and thereafter as Professor of Geography. Dr. Kobayashi has spent time as a visiting professor at the University of British Columbia, University College London and, most recently, Canterbury University, Christchurch, New Zealand. In 1994, Dr. Kobayashi was a Fulbright Fellow at the Migration Policy Institute in Washington, DC. Other positions include President of the Canadian Association of Geographers (1999-2001), and Editor, People Place and Region, Annals of the Association of American Geographers. NNMCC . Last modified Aug 25 2012 4:26 p.m.